Music has been a part of our everyday lives. It helps us go through our hard days, and gives us more joy and excitement during our glorious days. The Winamp template is best for bloggers who enjoy sharing their favorite songs and giving out information about their favorite bands. What is the Navigation Layout of Winamp template? The navigation layout of a blog says a lot about your contents. You should remember that the template layout can affect your traffic. It can make your targeted audience leave your website or make them keep scrolling through your pages. With this FREE XML Blogger template, your targeted audience will find your website easy to navigate. The navigation menu bar is at the top portion of the page, making it easier to locate the important pages of your blog. What is more amazing with this template is, the screen size of the device that your audience is using does not matter. The responsive design adapts to the screen of the user’s device. What is a more suitable blog for Winamp templates? We should be cautious on what template we will use for our blogs as it can affect the web traffic. Winamp template is perfectly suitable for blogs that disseminates information or contents from the Music Industry. The XML blogger template has a suitable web design for the dissemination of music and contents. Its layout is strategically placed to garner more traffic and targeted audience. When you use this template, your targeted audience can also listen to the shared music. Ample Space Ads with Winamp Template! Ads can be a way for you to make some money off your blog and sell ads. When you use the Winamp template for your blog, there is an ample space ad strategically placed all over the website. It would surely be a catch to have some ads on your website when you have contents that are worth the read. However, it would be nice to place ads on the spaces that are related to your contents. 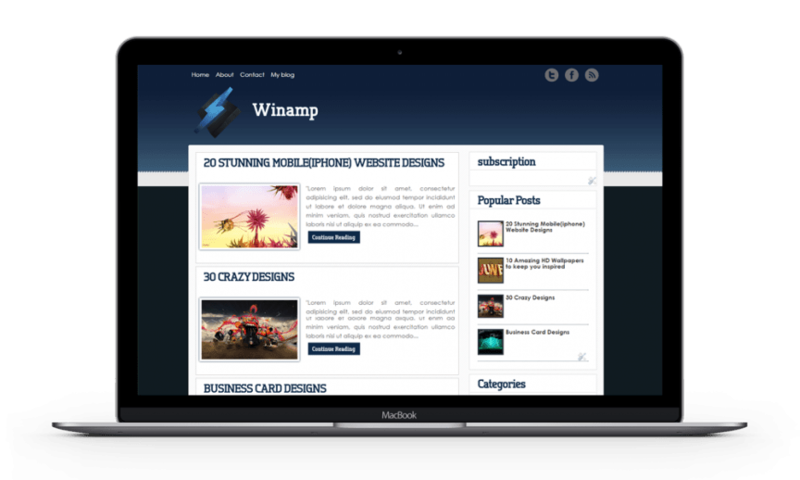 Download the Winamp FREE XML Blogger Template. We all know that you want to have the best template for you to share your music and opinions. But, how we value the content equates on how we should value the template layout of our blogs. With the Winamp template, user experience to web traffic is surely given at large. Do you like the Winamp template? Share with us your opinion. If you have any suggestions, we would love to hear your feedback. Drop it in the comment section below. Winamp	Overall rating:	5	out of 5 based on 2	reviews.